It was a frigid night. My patch was fine, my mat stayed full. And still, it was bitterly cold. I had to wait a long time for a hitch to Etna. The first vehicle going east was a car full of dogs. I would’ve loved to have sat in the back with all those dogs, but probably there wasn’t room. Ten minutes later, I heard the second car coming up the hill. Skidding on some corners by the sound of it. Oh I don’t want a ride from you. A pickup truck with a motorcycle strapped in the bed came screeching around the corner, the driver in no mood at all for hikers. The third vehicle took its time getting up to the pass, a big engine laboring with something heavy. A semi pulling a flatbed trailer full of huge boulders. Plenty of good hitches going the other way. The drivers all waved to me. Finally someone pulled over. It’s a longish drive to town. The first thing I noticed was the many deer drifting around town. Everyone drives super slow and I guess you just put up a 20 foot fence if you want a garden. 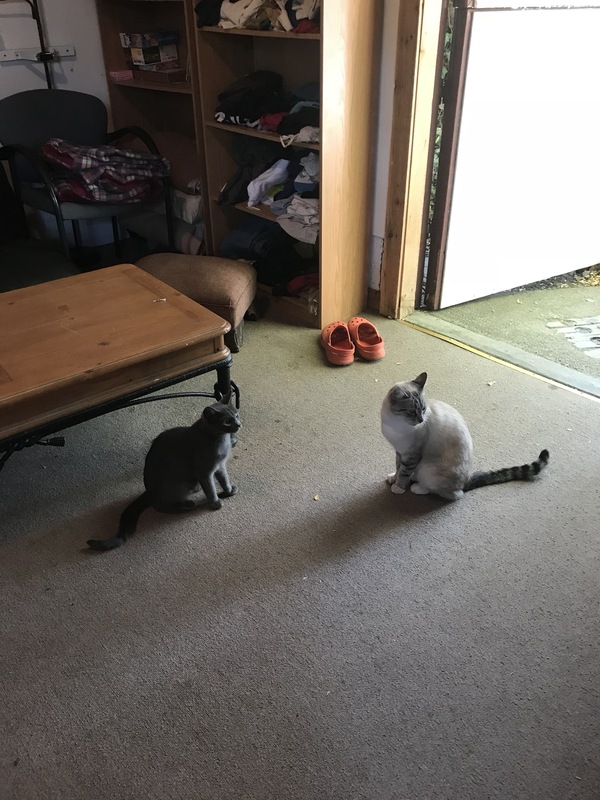 Here’s the Etna animal report: Hiker Hut has two cats. The gray one is still nearly a kitten and you can pick her up. They both came wandering in the hut when I left the door open. I didn’t really need to shop. Just some coffee stuff. My coffee situation is getting complicated. There were plenty of restaurants in Etna. Tempting as the Sun Tacos sounded, I cooked dinner at the hut. I heard a strange and alarming noise outside. It was raining. Just for a few minutes but still. Was it raining up in the hills?